Our Network is about people: what they know, what they learn together and what they create through partnerships. Our strength lies in the ever-growing knowledge base we accumulate through the collective efforts of the people involved in the Network. Our members include Lakehead University faculty, researchers, students, community partners and the FSRN’s team of dedicated staff. 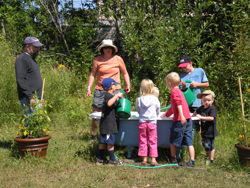 The innovative approach of using Community Service Learning focused on food security has attracted a diverse group of multi-disciplinary faculty and resulted in a comprehensive approach to food security, including issues of production, distribution, processing and marketing, social justice issues of fair income for producers and fair accessibility for consumers. Numerous faculty have been engaged in an interdisciplinary theme-based service learning initiative focusing on food security. Informed by Complexity Theory, our Contextual Fluidity partnership model links community partners, students, and researchers in the co-evolution of knowledge for social impact in food security.